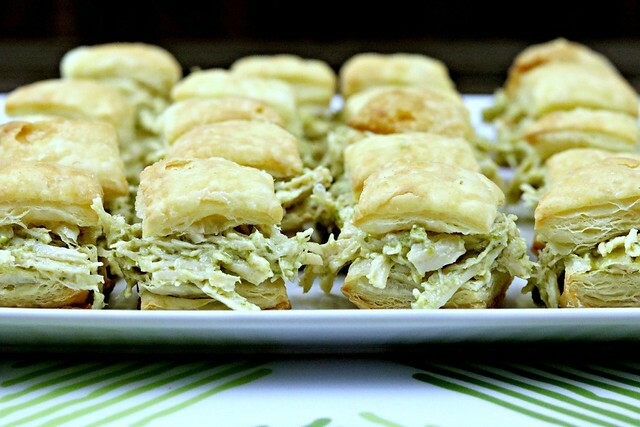 Creamy pesto chicken is sandwiched between bite-size puff pastry pieces for a light and flaky twist on a mini sandwich bite! It is no secret that I love sandwiches. Or basically all things carby. But I’m always on the hunt for new delicious ways to have a sandwich-like meal. This particular venture came about while I was trying to decide something fun to do for Finger Food Friday, involving pesto and chicken. Because I had some pesto to use up, and J loves it. Originally I thought about doing pesto chicken crescent rolls, but if I’m being honest, I can’t wrap my head around chicken salad and baking it in the oven. Mental block, for sure. So, I had to think of a way to do a bite-size treat using cold pesto chicken salad. And then I remembered I had a puff pastry sitting in my freezer, just begging to be used. 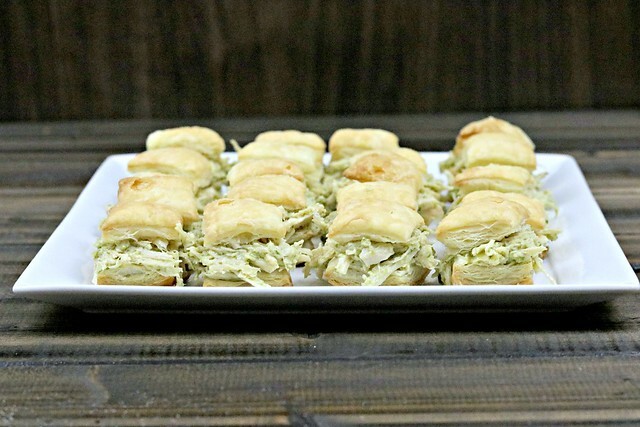 I started searching around for ideas, and came across the idea for these little puff pastry bites. And how cute are they?!?! And you guys, this is one of the easiest things to make. 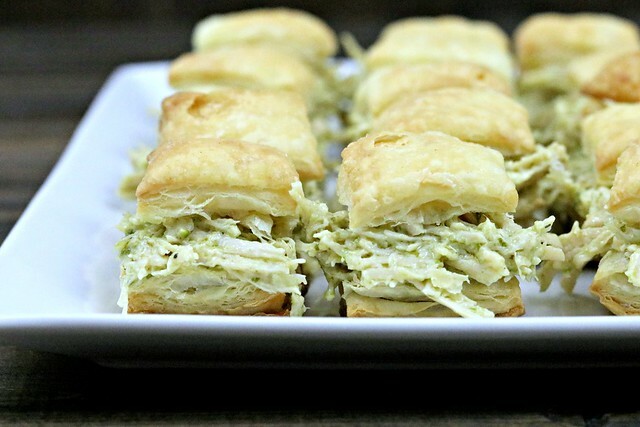 Whip up your chicken salad, slice your puff pastry into squares and bake a few minutes, then cut the little puffs in half and fill with chicken salad. Done and done!! Oh, and definitely be careful, they are way to easy to put down one after another, until you’re so stuffed you can’t move. Not that I know this from experience or anything. J loved them, probably solely based on the fact that they involved pesto. He loves that stuff, for real. But the puff pastry makes for a light sandwich, versus a heavier bready option. Also gives a nice little crunch when you bite into it. All-in-all, I’d say this was one of our most successful ventures for Finger Food Friday! Now I just need to make it a point to make more dishes using pesto. Gotta keep the hubby happy, since he’s such a trooper with all of my experimenting and kitchen adventures. Preheat oven to 400 degrees and line a baking sheet with foil or a silpat sheet. Allow the puff pastry to thaw just enough to easily unfold it. This will only take 10 minutes or so, if you take it out of the wrapper. Cut each of the folds to make 3 long pieces, then cut each of those in half longways, and then cut those strips to make 12 squares, totaling 36 squares. Place squares on the prepared baking sheet, brush with melted butter and sprinkle with salt. Bake for 12-14 minutes, until puffed up and lightly browned. Allow to cool, and then cut each square in half to make top and bottom halves. While the puff pastry is baking, prepare your chicken. Pound each breast so that it is about 1/2-inch thick, for quick and even cooking. Spray a skillet with cooking spray or drizzle with olive oil, and heat over medium-high. Season chicken with salt and pepper and cook for 4-5 minutes per side, or until cooked through. Remove to the bowl of a stand mixer, and let sit for 5 minutes. Then, shred using the paddle attachment, or with two forks in a medium sized bowl. Stir in the mayo, pesto - start with 1/4 cup and add more if desired. 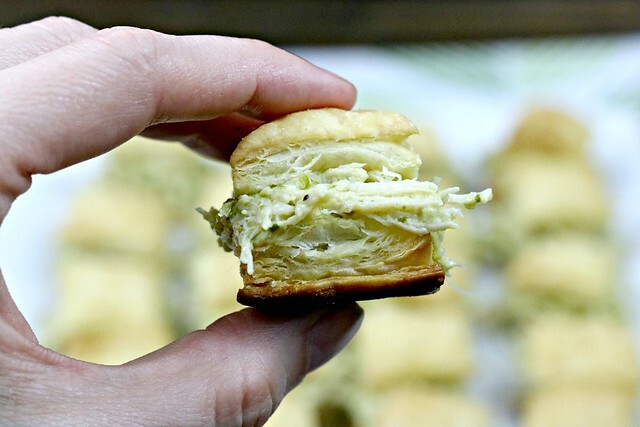 Mix well, and then add about a tablespoon of the pesto chicken to the bottom half of each puff pastry square, then add the top to complete your bite. Serve as-is on a plate or platter, or fancy them up for a party with cute toothpicks!